We are excited to begin arts week. We have a wide range of activities planned for children to take part in. The theme this year in Spain and rainbows. Miss Cleave and Mrs Hindmarsh can both speak Spanish. Miss Cleave lived in Spain for two years and Mrs Hindmarsh recently visited on a trip with other members of staff. Keep checking back on a daily basis to see what we have been up to. Today we had a special visitor to start arts week. A lady came in to teach us some Spanish flamenco dancing. She started the session with us by warming up. We had to move our neck, hands and legs to get our muscles ready for exercise. We then learnt some flamenco moves. It was a great experience and everyone got involved. After our dance session, we went back to our classes and learnt about the famous artist/architect Gaudi. We looked at some of his creations. We focussed on the building 'El Capricho'. We looked at the tiles on the building. After we designed two tiles of our own. We will select one tile design to create on Wednesday. We continued to create our Modroc structure with Mrs Warren. We helped Mrs Warren paint the 'Gaudi inspired' structure in the same colours as the Spanish flag. We also used acrylic paint to design and paint a CD. We will use the CD's to carry out 'scratch CD art'. The CD's will be featured in the Gaudi structure once it is completed. Today we had three activities on rotation. In Mrs Howard's room the children were able to make their clay tile. The children used a tile cutter to get the square shape. They then used the off-cuts to create the flower. In Miss Oakely's room the children had the opportunity to complete a printing activity. Each child made a mosaic design and then printed their design on to a coloured piece of paper. In Mrs Neylon's room children heard about some Spanish festivals. Children had the chance to try some Spanish fruits and evaluate them. Miss Cleave played her violin and sang the rainbow in Spanish. We listened carefully to the colours and repeated after Miss Cleave. We absolutely loved the performance! 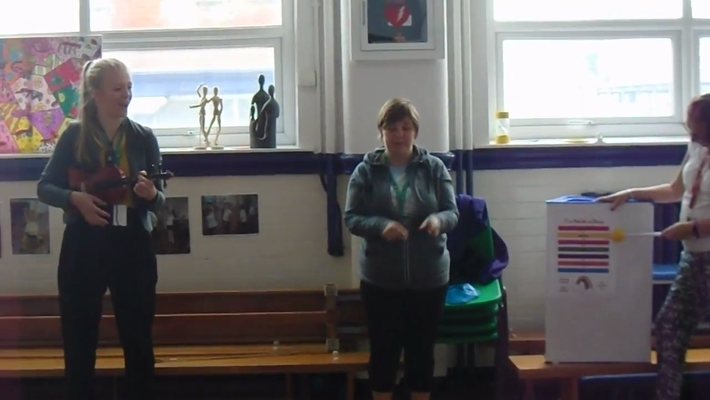 In addition to this, two Spanish teachers, Michelle and Jasmin came in from Edge Hill University to work with us. They taught us some basic words in Spanish and played some games with us. We had lots of fun!